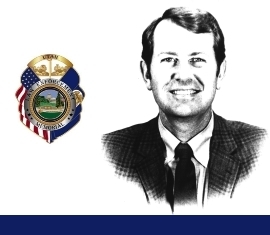 Detective Clark was shot and killed during an armed robbery. The 42-year-old victim and other officers were conducting a stakeout of a pharmacy located at 564 Third Avenue. Information from an informant had revealed that the pharmacy would be robbed. At approximately 2100, two suspects arrived and were in the process of robbing the pharmacist when the victim left a position of cover and moved closer to the doorway. As the suspects exited, Detective Clark called for their surrender. He was shot in the head with a 9mm handgun. The suspect who fired the shot was killed by return fire from other officers. The second suspect surrendered and was eventually committed to the State Hospital. Detective Clark was married and the father of seven children. He is buried in Salt Lake City Cemetery. His bronze name plaque is sponsored by the Percy L. Clark family. I was in school attending Viewmont High in Bountiful UT when a friend of mine asked me to go with him to SLC after school. Something told me not to go. Latter that night on the news I saw my friend and others and the seen on the news is etched in my mind. They picked him up hitch hiking. I will never forget that night. I could of been their.Since that time I have meet others that work with Percy and told me how great a man he was. This last week I lost a good friend Brian Harris a deputy for Kane County. Brian was shot and killed across the state line in Fredonia, AZ. My hart goes out to all who gave their life to protect others. Watching another fallen officers service today. Thinking about thirty nine years ago, was only eleven at the time remember very vividly for that age. A great man was taken that evening. I know personally how much he meant to my parents. Dad told me many times that PERC was his idol. To all his kids my cousins you know he’s always with you. I would like to thank you for talking with me the other day about your father. My god bless you and your family. I love you grandpa, I wish you could meet your great-grandchildren. They know what a wonderful man you were. Dear Percy – I want to thank you so much for coming with Jesus to see Duffy in the hospital in St. George in September, 2015. He was so thrilled to tell me that he had seen you and the Lord during the night, emphasizing that “it was not a dream” but very real. Your action that night gave Steve much comfort and I believe that you were there at the hospital in SL to take him home with you to the Lord. Now Michael is with you also. I hope that by now you all have had many, many meaningful and memorable times together.